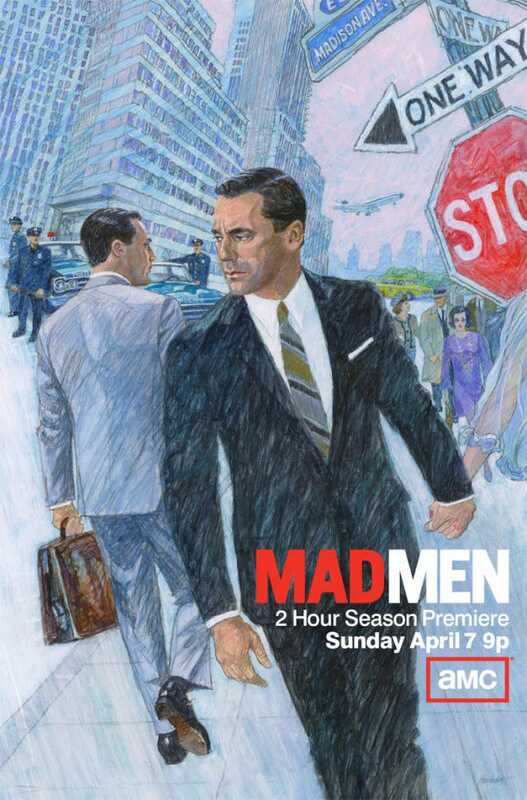 "In the five seasons that “Mad Men” has been on television that celebrated series set in the art-directed world of 1960s advertising has never marketed itself the way a ’60s ad man most certainly would have: by calling in a hotshot illustrator to do the job. But as the show prepared for its new season, which begins April 7, its creator, Matthew Weiner, inspired by a childhood memory of lush, painterly illustrations on T.W.A. flight menus, decided to turn back the promotional clock. He pored over commercial illustration books from the 1960s and ’70s and sent images to the show’s marketing team, which couldn’t quite recreate the look he was after. “Finally,” he said, “they just looked up the person who had done all these drawings that I really loved, and they said: ‘Hey, we’ve got the guy who did them. And he’s still working. His name is Brian Sanders.’ "
Which explains how a 75-year-old illustrator living outside of Cambridge, England — highly regarded in his own country but little known in the United States — came to create the image that beginning this week will be emblazoned on buses, billboards, magazine pages, Web sites and TV. The ad, depicting Don Draper, the show’s lead character, in a vertiginous pose on a New York City street corner that seems to be collapsing on him like the decade he is living in, looks as if it has time-traveled from the pages of an old copy of Reader’s Digest."